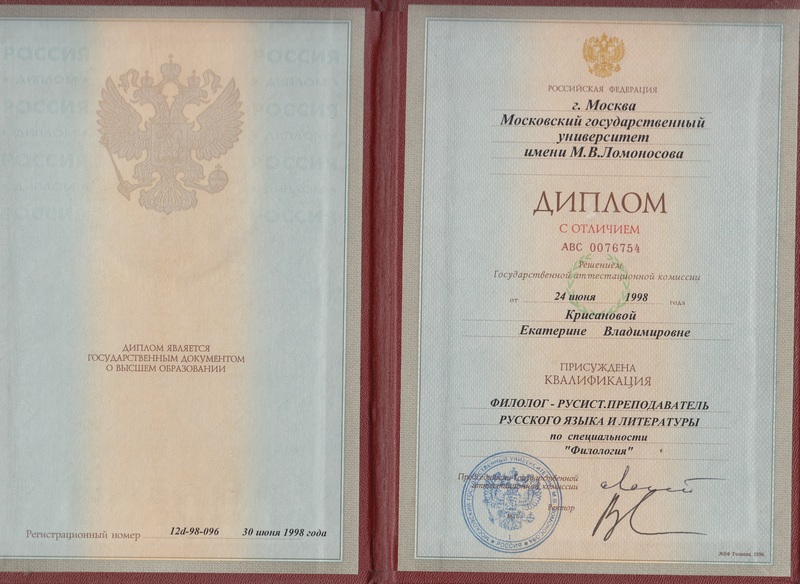 \////In 1998 I graduated with honours from the Philological Faculty of Moscow State University n.a. Lomonosov. 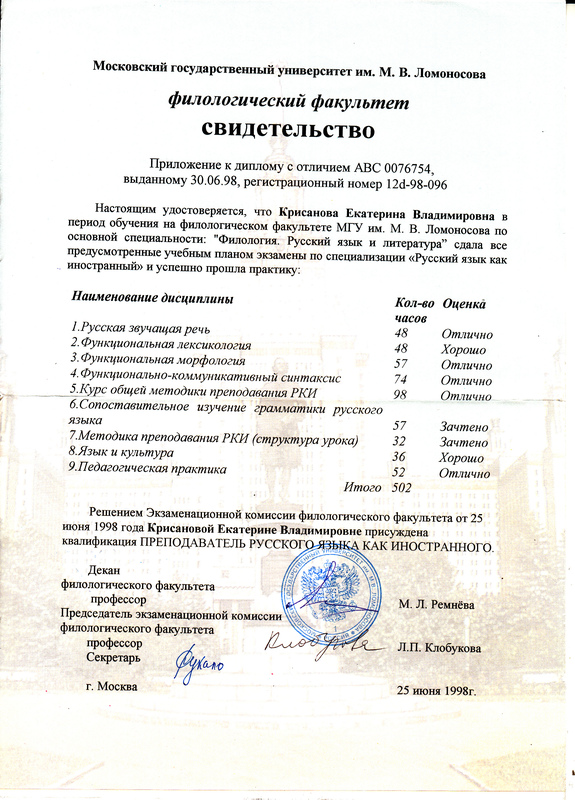 I qualified in two specialisms: linguist, specializing in Russian philology and teacher of Russian as a foreign language. Then I took a postgraduate course. In 2002 I defended my thesis and was awarded a PhD in philological science. 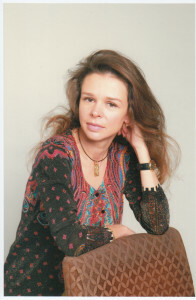 \////In 1998 I began to work in the Center for International Education at Lomonosov Moscow State University. I taught Russian to foreign students (beginners). In 2003 I was promoted to senior teacher. In November 2013 the Center of International Education was renamed the Institute of Russian Language and Culture. \/////Over the years I have worked with dozens of students. Usually they begin to study the language from zero, starting from the alphabet, and finally progress to Russian in the Basic or the First Certificate levels and pass appropriate tests successfully. 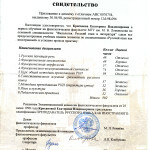 The “First Certificate level” in the “TRAF” (“ТРКИ”) classification system corresponds more or less with the European level “B1”, or “upper intermediate”. 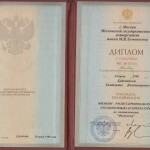 It’s the level that allows you to get higher education in Russia. Students who have continued their studies as well as students of correcting courses felt satisfied with their progress in Russian. \/////My individual students are expats, the majority of them work in Russian representative offices of international companies. They are managers or senior managers, as well as their spouses. Usually they need Russian for everyday conversation in the foreign country. I worked with people from such companies as VimpelCom, LG, Samsung, Technip, Tenaris, OBI, Terumo and others. I also provide language training service for Global LT and Learnlight in Moscow. I like the Russian language. I believe that language is a living thing and it lives its own life. To observe its behavior is one of the most fascinating activities in the world. I like teaching Russian to foreigners. To teach is to constantly solve puzzles: how could I describe the maximum of language facts in the minimum steps. To teach is, according Socrates, to be a “midwife” who helps ideas to be born, i.e. who helps a student “to give birth” to new knowledge about the structure of the Russian language. And I like my students. There are so many stresses in our life – a lesson should not be one more stressful situation for a client. It’s extremely important that at a lesson we would feel comfortable and would be able just to relax and smile. \\\\\\\I speak English and Spanish. But it doesn’t mean that all of my students are necessarily English, Spaniards, Americans or Latin Americans. I’ve worked with people from many different countries such as Japan, South Korea, Turkey, Egypt, Germany, Italy and others. \\\\\\\If your native language is something else but you can speak English – you may feel free. We will understand each other even if you speak little English. In fact when a professional teaches Russian as a foreign language he doesn’t deliver complicated theoretical lectures in an intermediary language. Many things can be understood by means of visual aids or situation, and grammar is explained with the help of very simple tables and formulas plus a minimum of grammar terms that I prefer to say in the native language of a student. Thus I know the basic grammar terminology in Korean, Japanese, Chinese, Farsi, Turkish, French etc. \\\\\\\And what if you don’t know a word in English or in Spanish? Actually it’s possible to work without intermediary language at all. On the one hand, it’s going to be harder and slower at first. But on the other, it has an advantage of total non-mediated immersion in the Russian language. \\\\\\\In any case, remember: a professional teacher of Russian as a foreign language, even if he doesn’t know your native language, is preferable to a person who speaks your language but does not have appropriate qualification and experience in teaching Russian to foreigners.